Scripps is the only one of The Claremont Colleges with its own library. 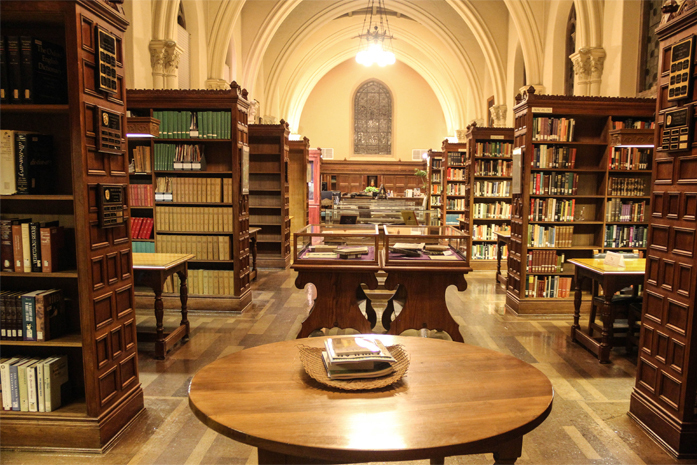 The Ella Denison Strong Library is a special collections library with a variety of comfortable and quiet spaces for study and research, including the Holbein room and its gothic fireplace. Among the library’s many distinguished holdings are Emily Dickinson’s letters and the Macpherson collection of books by and about women. The Scripps College Archives provide materials on the history of Scripps and include the Ellen Browning Scripps papers. In addition to a Rare Book Room and rotating exhibits of its contents, the Slocum Award for Senior Book Collections exhibit is on view each spring. Of course, students can always search for what they need by computer, but it’s also fun to browse the old card catalog. The building itself is also a treasure. Designed by the original campus architect Gordon Kaufmann, its distinctive architecture — with its central stained glass Gutenberg window celebrating the development of learning through the written word — and the beautiful hand-carved wood interiors combine to create an environment encouraging learning and reflection. It’s also part of Scripps tradition. The key moment in the Matriculation Ceremony occurs in the first few days of Orientation, when incoming students process through the intricately carved Ella Strong Denison Library East Door. This door remains locked on all other days of the year save Commencement, when graduating seniors exit through this same door, signifying the beginning of Commencement Exercises, and the end of their educational journey at Scripps. The Claremont Colleges Library is the central library of The Claremont Colleges and the third-largest private academic library in California. The joint library resources of The Claremont Colleges include more than 2,500,000 volumes, and students have online electronic access to more than 70,000 titles and journals. If a book isn’t available locally, the Claremont Colleges Library provides a robust resource sharing service to borrow resources from other libraries regionally, nationally, and globally. In addition to the holdings, the quiet study spaces and cafe on the first floor of the Claremont Colleges Library offer more reasons to visit. The Claremont Colleges have a number of affiliated libraries that specialize in children’s literature; biology, botany, and horticulture; and biblical studies and theology. Students also have access to regional university libraries and other resources.